How do I edit / update my rates? Offering rates allows you to change the cost of the rent for different times of the year. Maybe there is a festival in town that draws travellers, or maybe you want to charge a different amount in the summer than in the winter. Add those different rates to your property. Once logged in, click your name in the top right corner, of the page and click the Account Dashboard button. On the left side of the page, click the Listings button, and if you have multiple properties, click on the listing you would like to edit. Your default rate will be used to determine the rental price for a traveller if you have not specified differently for those dates. To edit your default rates, click on "Edit Rates" at the top of the screen. You will be redirected to your calendar page where you will be able to tailor your rates according to your preferences. To edit your rates, click on any date on the calendar. You will have the option of keeping the rate the same the default rate, or editing the nightly rate for this specific day of the calendar. 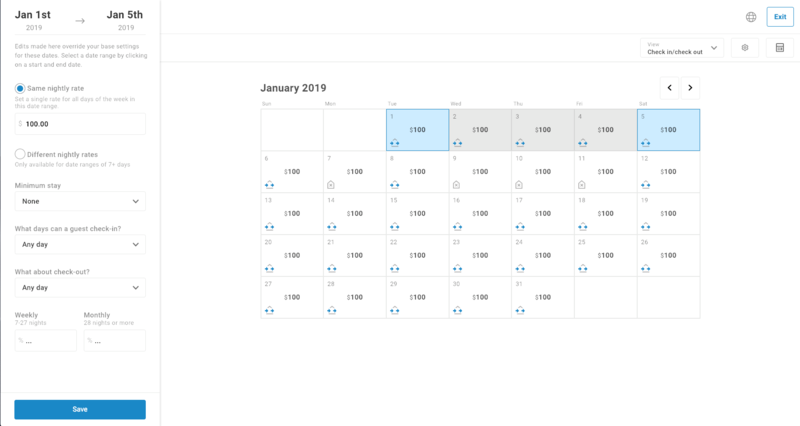 You can also set the same nightly rate for a series of consecutive days by clicking on the first day and hovering over the dates on the calendar and clicking on the last day. please select "Different Nightly Rates", and set a rate for each day you selected on the calendar. You can determine a minimum stay and a check in and check out day to the set of days you have selected on your calendar by clicking on the drop down menu. You can also set a your changeover days for the selected dates by selecting the days of the week from the drop down menu at the bottom. You can offer a discount to travellers for the slected dates from the calendar. To do so, please select the type of discount you would like to offer (weekly or monthly) and set a discount percentage for the selected period.